One of the biggest advancements in the modern times has been the development in the mobile technology especially in the last few years with the invention of smartphones. We have now gigabytes of memory in our mobile phones and can send and check e-mail in it and we don’t feel too surprising about this fact but just till few years ago this were far from possible as very few had email of their own and memory was stored in a big floppy disk that too just of 5 MB in size. The way the technology has changed it has also changed our lives totally and the way we lived. The mobile technology has now developed in such a way that we can now even integrate other form of technologies which none of us had imagined would be even possible till few years ago. Now you can check the weather in your area, listen to any song that suits your mood, get the route guide to any place you want to go and much much more. Have you ever imagines how the technology is going to develop in the next few years and how it is going to change our lives? 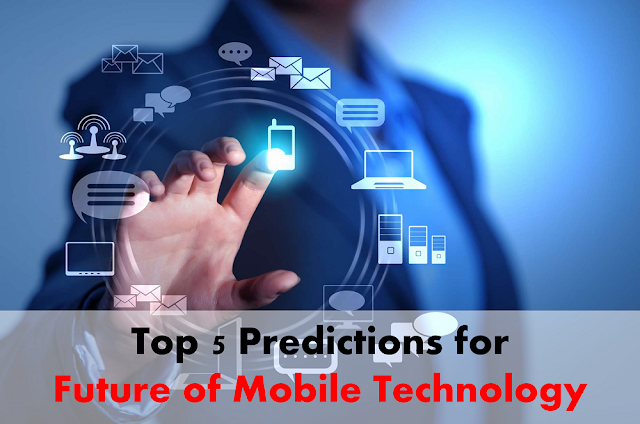 Let have a look at what surprises the future of mobile technology holds for us. The mobile builders have always been trying to make more powerful, smaller in size and consume less energy. And not the development of such devices is more like to be made. Lots of companies are now focusing on having a transistor built into their products and making it more powerful. The rapid growth of mobile technology is also changing and speeding up the trend. The mobile of future will also be having combined multiple radios, Wi-Fi, 3G, WiMax in just a single device. The smaller and more powerful chips will lead to smaller and more powerful mobile devices and its applications. Soon we will be able to synchronize and access data between devices and desktops wirelessly. The short range wireless connections for the cords will also be useful in the better entertainment like watching videos everywhere at home. And using these technologies with our mobile devices will be the real benefit. The top mobile vendors and builders are now working on developing foldable and smart displays. These will enable the mobile devices to display the data much easily on better screens. Using the e-paper for the mobile device you can maintain the image with the device using no power at all. The foldable displayable e-paper will allow you to take it out of your pocket anytime and read the latest news in it. We do have a very good security system for our mobile devices now but still there are lots of complains regarding the breach in the security by the hackers. The development in the security systems is also very much necessary for the future mobile devices and it will surely be developed soon. The better security for the mobile phones will lead to more secure transaction of money, sensitive and private data and much more. You will also be able to use your mobile and gain access to secure places like in office or even at an Airport. The flawless speech recognition is another amazing addition to the mobile phones of future with the powerful chips. With today’s smartphones though having speech recognition people found that it was better to type the number than to use the speech recognition. With more powerful mobile processors people can now use the speech recognition more accurately than before and won’t need to unlock, open the keypad and type the number or message. You can even use other complex functions in it like web search, buying things online and much more other activities. These are probably the top prediction about what all we can predict about the future of mobile technology. We will keep you updated with what all latest trends or news we find related to technologies or iPhoneApp Development tips.